Arthur Francis Basset Hull (1862-1945), public servant, philatelist and naturalist, was born on 10 October 1862 at O’Brien’s Bridge, Hobart Town, son of Hugh Munro Hull, coroner and later clerk of the House of Assembly, and his wife Margaret. Educated at the High School, Hobart, he was lamed by infantile paralysis at 15 and had to wear a surgical boot and use a walking-stick for the rest of his life. From his boyhood Hull collected stamps and was an honorary fellow of the Royal Philatelic Society, London, from 1887. 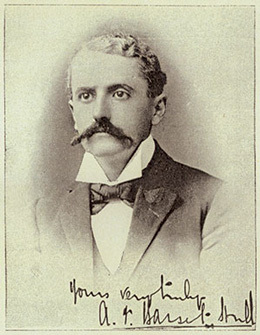 He published Stamps of Tasmania (London, 1890), The Postage Stamps of New South Wales (London, 1911) and The Postage Stamps of Queensland (London, 1930) and edited the Australian Philatelist. From 1883-89 he was a clerk in the registry of the Tasmanian Supreme Court. Bassett Hull married Laura Blanche Nisbet on 29 April 1891; she bore a son and died in 1893. Hull moved to Sydney and on 12 October 1892 became a clerk in the General Post Office. On 1 July 1900 he transferred to the Department of Public Works as secretary to the labour commissioners. He then married Caroline Ann Lloyd and later visited Britain and Europe. On his return he joined the Department of Mines as a clerk in January 1903, remaining there until his retirement in 1921. He died in 1945. The Postage Stamps of Queensland was published in a very small run of only 200 copies by the Royal Philatelic Society in London in 1930. The book concerns itself with the Chalon issues (1860-79), large Chalon issues (1882-1912) and revenue stamps valid for postage purposes from1881-92. The chapters on watermarks and perforations cover the entire Queensland period from 1860-1913. The book has been split into three pdf files for easy downloading and viewing. Part 1 goes to page 60, part 2 from page 61-116 and part 3 from page. 117-181. A set of photo plates was produced for this volume I. A further two sets of photo plates was also produced for a proposed volume II, which never eventuated on the Sideface issues, in two parts; the 'original' set (volume II) and an additional set (volume IIa). All three sets of photo plates are included in the links below.